Arata ate mud for the first time. I was chatting in a cafe with Yuko and when I looked for Arata, I caught the shocking site that Arata sitting on his legs properly, Japanese Seiza position, and eating mud from a flower pot with both hands! He finally caught a cold. Is it because of cold or eating mud? He had diarrhoea. 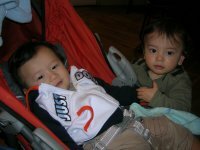 Arata is posing with Thoma, who is now 6 months old. This pair are quite mature looking and don't look 0 year old babies! This is how they looked 3 months ago.